“March 26 th at 730pm saw the ending of yet another BrightHaven era, with the death of our amazing super-dog-man and old soul, Bailey. I am not sure that I can do justice to this larger-than-life character and the depth of the passionate being who lived life HIS way, played hard and NEVER suffered fools gladly! We changed his name to Bailey but from the very beginning Richard found himself thinking of him as “Jimmy” as he felt a strong and pre-existing bond between them, perhaps from a former life together. 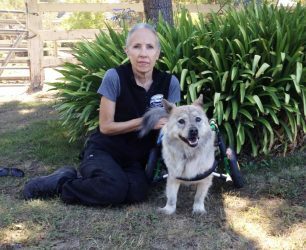 The early part of his story was published in this beautiful and heartwarming blog by Kathleen Prasad of Animal Reiki Source: https://www.animalreikisource.com/paralyzed-dog-no-hope-finds-happily-ever/. Soon after arriving at BrightHaven, Bailey experienced a nasty crisis involving yet another surgery, this time for the removal of bladder stones, after which our supervising veterinarian Chris Barrett, DVM, eagerly accepted the role of his personal classical veterinary homeopath helping us to steer the course of a great and healthy life to the very end. 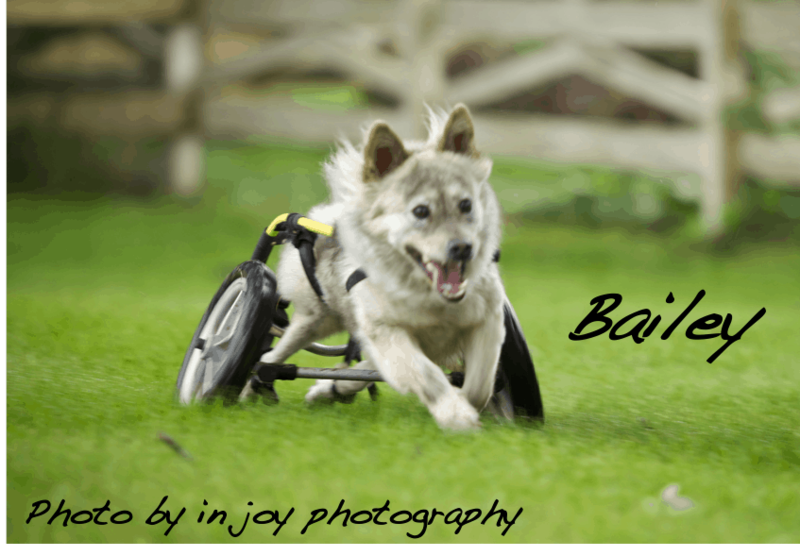 Bailey soon became a central figure in our daily lives and frequent BrightHaven seminars, touching the hearts of all he met with his eager, loving, feisty and somewhat controlling nature! He held court in the center of everything on the couch and woe betide the student who may have inadvertently forgotten having a snack in his or her bag! 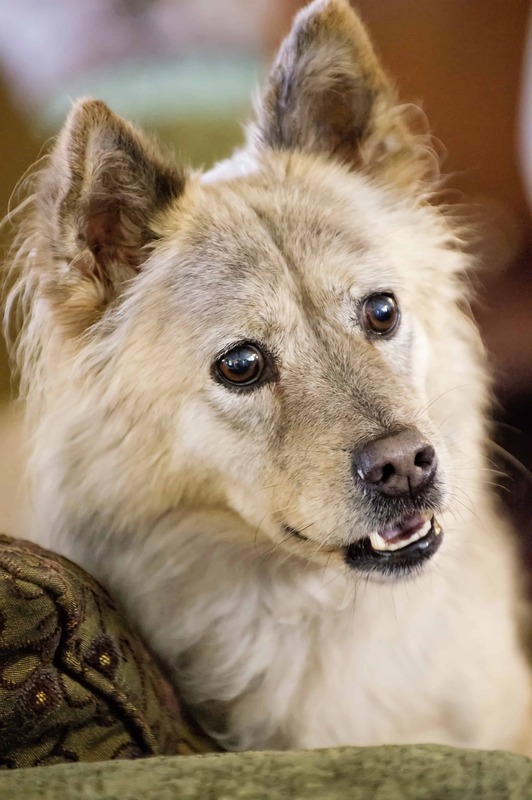 The spiritual side of this incredible dog may have broken through mostly during times of animal Reiki meditation led by Kathleen Prasad, when, with a big sigh followed by a gentle relaxation of the physical, Bailey surrendered to his true self. Perhaps one of his most favorite pastimes was his exciting and adventurous walks with “Auntie June” (North) who often came to visit him at the sanctuary. And then there was the deep, loving bond that Bailey shared with Fray (Huffman), who has worked withBrightHaven for many years. Bailey stole Fray’s heart right away and it remained his for his entire lifetime, reminding me of the poignant and so very beautiful poem titled “Funeral Blues” by W .H. Auden. Bailey began to slow and show a gentle decline a couple of weeks ago, and we were shocked when testing revealed end-stage values. It was determined that nothing could be done – other than that ol’ BrightHaven magical recipe of care for every life stage, the BrightHaven Menu for Healing, which nevertheless helped him to enjoy each and every day’s food and walks and fun. The day before his death he let go of his old (only slightly aggressive….!!) personality, likely due to his vulnerability, and allowed us all to “be” with him as we have always wished. I took him for a short and very enjoyable walk at 730am, after which he declined breakfast, accepted a treat or two and then, resting, began his easy journey with eventual focusing forward to what lay in store beyond…… Bailey died at 730pm in the arms of Fray, Richard and I. His passing was very gentle and swift. I guess he had places he needed to be. Fray is with us and will remain here as she grieves and prepares to discover her own new daily normal without the love of her life. Bailey lay in state looking as “wolfish” as he would have wished for, draped in a Buddhist prayer shawl, watched over by the powerful and protective panther and the dragonfly for transformation and light, and bedecked by his favorite lion toy. Of course, Bailey also had the BrightHaven teddy bear brigade to watch over him, the magical power of the unicorn, an angel and other mementos of his life. His flowers were stunning orange and red straw flower plants in glorious bloom. They will soon be planted in his honor. From the first day I saw you, I knew I wanted to take care of you. You were so strong and tough, yet so fragile and timid. I knew I wanted to protect you, love you and show you what having a family is like. You had lost hope and trust in humans as your heart was shattered into a million pieces by neglect and abuse, yet you still had a glimmer of light and hope in your beautiful eyes. I wanted nothing more than to love you and help restore your trust in humans again. You took a second chance and opened your heart to me. We stuck together to the end, in good and bad times. You kept me going. Your determination and strength was my inspiration. 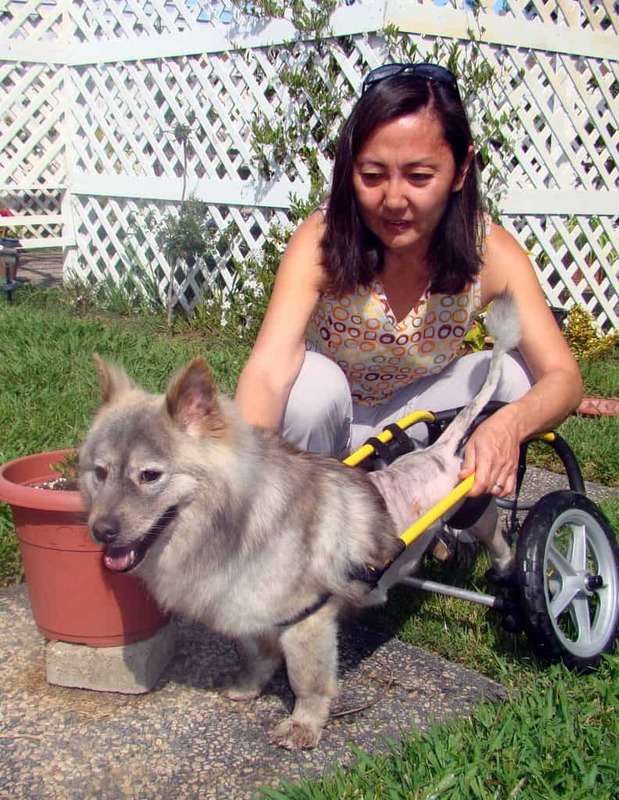 You were unable to move your legs, but that never stopped you. You took care of me and I took care of you because that’s what families do. We shared lots of cuddles and love, lots of moments that I’ll never let go. Our walks together I’ll forever miss. My life has been changed forever because of your love. your paw prints on my heart let me know you’re still walking by my side. Run free, my boy – you have traded your wheels for wings. We can now only imagine Bailey leaping and flying along the path to his afterlife – whole and strong again…Look out everyone – a panther approaches!